Readymag may be one of the best assistant in creating any kind of digital publications, helping you create your very own stylish microsites with ease. 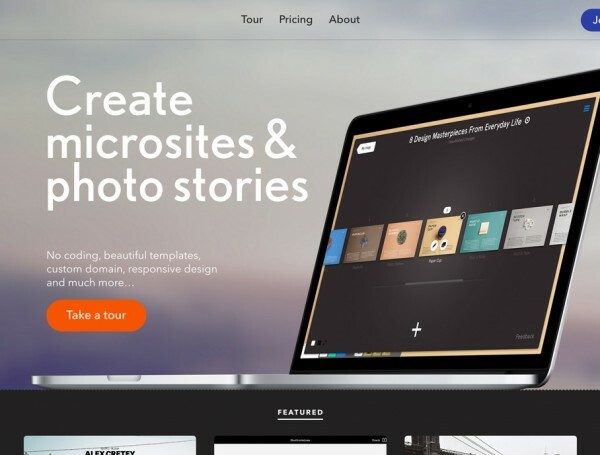 Readymag enables you to create digital magazines, portfolios, presentations and photo stories with ease. There is no coding needed and you can create beautiful sites, with a variety of templates and responsive layouts, including custom domain name. Photography is the best way to document life’s personal moments, but the way you frame these moments and share them matters a lot. Readymag is a new online tool for creative professionals, which makes it easy to create beautiful web publications without any knowledge of code. Whether you’d like to make a professional portfolio or create a travel journal — Readymag will help to give your photographic experiences a new unique shape. New York from a different angle, capturing great spots around the city that might not be yet popular among tourists. Flawless photography and useful tips. The breathtaking Norway for the envy of all the trailblazers. An inspiring travel photo story through the lenses of Johannes Heuckeroth. True essence of the city of Jakarta. Long walls of concrete, blackened by time, absence — Densamentes popolato [Heavily depopulated] — a mesmerising photo story by Italian photographer Carlo Piro. The incredible journey through Indonesia by designer and photographer Anton Repponen. Backpack, camera and two tickets — one to Jakarta and one back home a month later, the rest is up for adventure. Readymag offers a special discount to all the readers of Photography Blogger. Use promo code 10Photo to get 10% off any subscription plan, prices start at $9/month based on yearly pricing. You can also try Readymag with one free publication. Readymag offers many essential tools, including quick access to your media where you can connect to Youtube, Vimeo and Instagram to Readymag with ease. This five minute video gives you a quick overview of an array of must have features, and it’s worth taking a look. This is a sponsored post for Readymag. Photography Blogger reviewed the product and we feel this would be of interest to our readers, we only accept sponsored post if we feel strongly that a product or service will benefit Photography Blogger community. Join 20,000+ Photography Blogger readers to receive weekly photography inspiration. 5 Comments on "Readymag: One of the Best Web Publishing Tool for Creatives"
I would love to tray ready mag for my photoshoot publication. Nice. Never heard of them before but I do hope it doesnt turn out to be another “fly-by-night” social media fad that’s gone in a few months. Appreciate the discount too. Will check this out. How does it compare to weebly please? Subscribe to Photography Blogger's newsletter. 20,000+ weekly readers. I consent having to provide email address to Photography Blogger for future news, promotions email. Copyright © 2014 Photography Blogger. All images are © their respective owners.